The WWE Superstar Shake-Up is always one of the most exciting times of the year, as the WWE Superstars are mixed up and assigned new brands -- brands that they will be remaining in for most of the next year unless something big changes. This year, the latest addition to the WWE RAW roster came from the blue brand, SmackDown Live. One of the top heels from the blue brand, Andrade 'Cien' Almas, now known as Andrade, will be a part of the RAW brand. He started off his Monday Night RAW career with a huge match against a current WWE Championship holder. Andrade is one of WWE's latest Superstars to get their name changed by WWE for apparently no reason. He has now joined the War Raiders and The Miz in making the journey to the red brand. He had a good run on WWE SmackDown, but never really got going at any point of his career. Instead, he had a feud with Rey Mysterio, in a series of matches. Andrade is one of the best talents in WWE, and he proved that immediately upon his debut on RAW, without wasting a moment. He faced the current WWE Intercontinental Champion, Finn Balor, in a one-on-one match, where he defeated him. Andrade had ample support from his manager, as well, Zelina Vega. 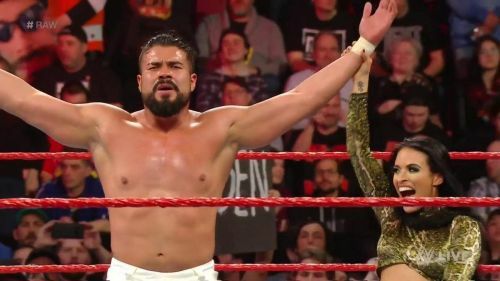 Zelina has also accompanied Andrade onto the RAW brand. Zelina's interference saw Andrade win his match on RAW. Having pinned the WWE Intercontinental Champion Finn Balor, it appears that Andrade is immediately being pushed into a program for the Championship. It will, of course, depend on whether Finn Balor stays on RAW or heads to WWE SmackDown the following night.